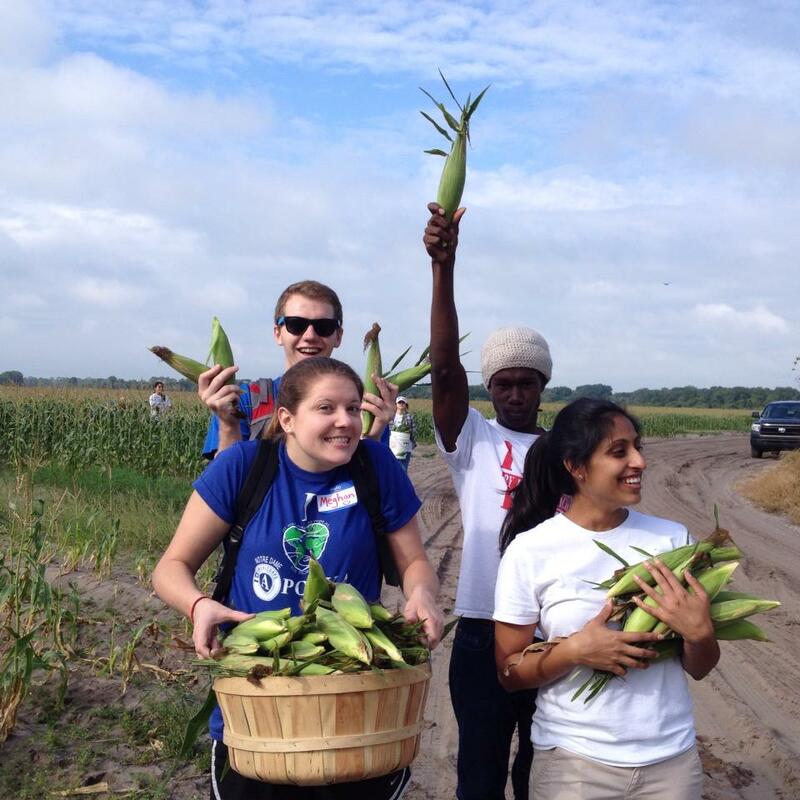 On Friday, as part of our bi-weekly NDA meetings, the Apopka AmeriCorps crew went gleaning. Gleaning from the verb ‘glean’ means: 1. to gather or collect (something) in a gradual way, 2. to search (something) carefully, 3. to gather grain or other material that is left after the main crop has been gathered. We were tasked with picking corn alongside other volunteer groups at the Long and Scott Farm between Zellwood and Mount Dora, Fla. This leftover corn was the crop deemed unsuccessful or not worthy of being sold, so it was left in the field to either waste or be picked by volunteers. Our corn, which we picked over 5 tons supposedly, went to Second Harvest Food Bank. Originally, I was apprehensive about our planned team-building activity. It was going to be hot and dirty and hard. Obviously, I was missing the point – as that WAS the point. The majority of those that the Hope CommUnity Center, our host site, serves are families who are either descendants of migrant workers or have members currently working in the fields. Other than tourism, Florida is primarily an agricultural state. Citrus, vegetables such as cucumbers and tomatoes, strawberries, sugar cane and ferns are all major crops that grow in Florida’s sandy, but warm climate. As we are beginning to learn, agriculture is a dangerous profession. In fact, it was listed as one of the most dangerous as recently as this August by the U.S. Department of Labor’s Bureau of Labor Statistics. Yet most of someone’s daily meals are all thanks to a farm worker. Our gleaning experience was simple. and fun. It was a grand adventure, reminicsent of Luke Bryan and country living. We piled into a pick-up truck, was driven out to two small fields and canvassed the rows selecting the remaining small, wimpy ears of corn while also sampling field-fresh corn our selves. It was an enjoyable experience, as it was still morning and was overcast – and we were outside for less than three hours. Corn isn’t a hard crop to pick; though the picker is stooped you merely have to bend to reach the ear and pluck it – it isn’t like tomatos which are picked along the ground, or oranges which are retrevied from tree tops. We sang Pocahontas and Uncle Kracker and Instagrammed photos of ourselves, but I couldn’t imagine having to feed my family off of wages earned from baking in the hot Florida sun in a sea of corn, picking crops all day long. If you had lunch today, thank a farm worker. Some of the AmeriCorps crew while gleaning. Photo Credit: Gil Portillo.